Place the first rails of the glorious train adventure that all started in the United Kingdom of Great Britain and Ireland in the 19th century. Learn to master the power of steam to build trains that go faster and farther, develop your technologies, and reach the far cities of Scotland and Ireland before your opponents! Also includes the Pennsylvania map � in a state full of railroad history, invest in the most profitable companies to develop your rail network. But do not let your opponents outbid you, or you risk losing the benefits of your investments! NOT A STAND-ALONE GAME! 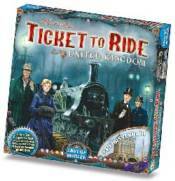 Requires an original copy of Ticket to Ride� or Ticket to Ride� Europe to play.